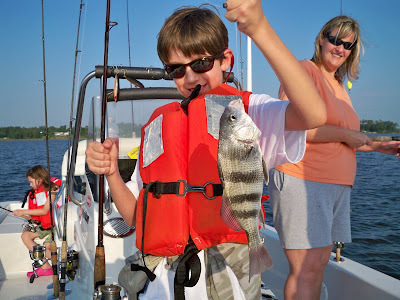 6/28 pm Trip- Sheepshead Galore! Well, it was back out this afternoon around noon and with "the wind a howlin." 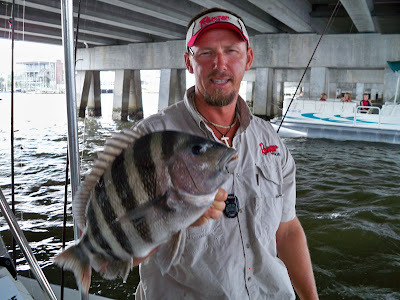 James King was hoping to target Sheepshead and or Redfish. 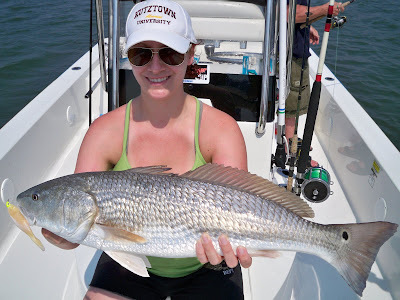 The tide was a little low so we began on the Sheepshead aaaannnddd... well, let's just say we never made it Red Drum fishing. 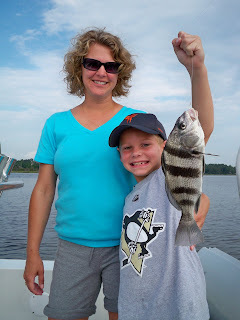 The three of us wound up with over 100 Sheepshead strikes and wound up landing 38 sheepshead and keeping 30 nice fish from 3/4lb to 5lbs for these guys to take home. Awsome afternoon on the water and not effected by the 20+mph winds. 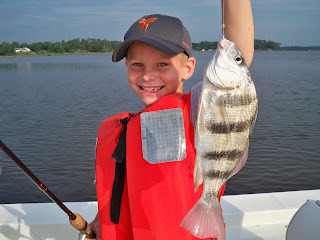 With Chris and Missy Baker along with their young ones William and Anna we eased away from the dock around 6am and traveled to a nearby creek to catch some shrimp and mullet minnows to use this morning to catch some Black Drum, Redfish, and flounder. within a few minutes we had a livewell full of nice baits. 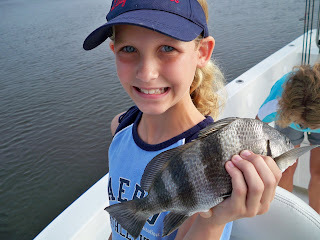 We started out working float corks around some oyster beds and found some hungry Black Drum. 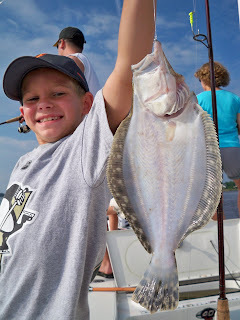 As we worked the surrouning waters we didn't find much else so, we decided to make a stab at the flounder fishing. 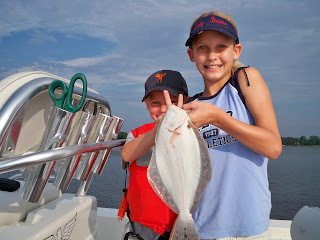 We spent about an hour drifting and wound up releasing 8 Flounder with a few decent sized fish. 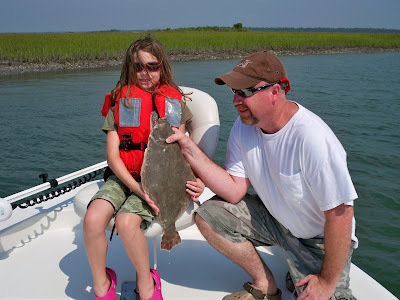 Our largest flatty today was about 3lbs Great Job William and Anna! It was great fishing with some skilled young people. Well, I know some of you would rather not have to listen to this but sometimes you've just got to let it out. It doesn't happen too often but I had a client call and cancelled out on a trip last minute for today, june 27th with no good reason. When the trip was scheduled he said he preferred to fish the ocean but as usual we agreed that if the ocean wasn't "doable" due to winds and seas that we would fish the backwaters. That's how I have to book all of my trips. I can't afford to turn down clients wanting to fish and then have an individual cancel with no emergency. I've turned down over 20 potential clients for today's date in the two weeks John Wossord has been scheduled. Unfortunately, because of contacts and time constraints, I did not take a deposit. I currently do this fulltime, for a living. I know the weather in my area better than the weatherman. I don't take clients fishing if the weather is too bad to fish. I always put 110% in my fishing trips and very rarely do we ever go without catching our target species! 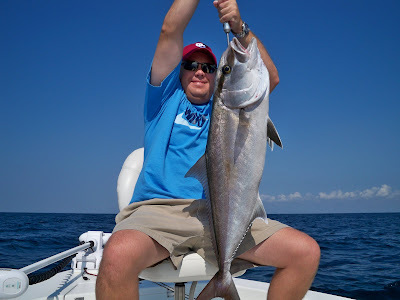 If someone is not willing to work with me regarding the weather and alternate species to target due to inability to fish the ocean... then don't call me for a charter... go charter a 50fter at 2000 bucks and you can go fish the ocean regardless of the wind. To other captains taking bookings, make sure you request a deposit from John Wossord if you choose to have this person onboard your vessel. I guess I still live in the days of honoring verbal contracts. Funny thing is this afternoon, while getting my haircut in a local salon, an older women (probably 80+) started a conversation with me about how society has changed so much from her childhood to now... the very next thing she said to me is she has learned the hard way that you just can't trust many people now a days. She said that back in the day, a man's word was his word, and he always honored his agreements. She had apparently also had someone recently not honor their aggreement. With Jesse T.'s group from PA onboard we made our way to the inlet but there were breakers clear across the inlet so we opted for the backwaters. 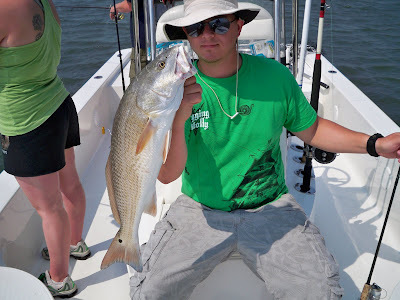 Jesse said they wanted to catch some big fish and they were used to catching small mouth bass so, after we spent a short while catching some flounder we moved on to locate some redfish. The conditions were tough today with winds about 20 mph and tides abnormally low. The first spot we stopped on that has been holding fish had almost no water. Our second stop still had a little over a foot of water but the water was not very clear. We continued working this location and lucked out as a school of redfish came to us. 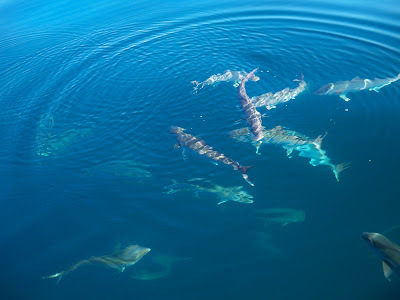 They flashed in the murky water next to the boat and we instantly hooked up. We landed several fish in this school before heading back to the dock. Conditions were tough but we had a successful trip. Thanks for your support guys! Today I had a young man on a mission, Jeremy White, along with his father, Jeff. 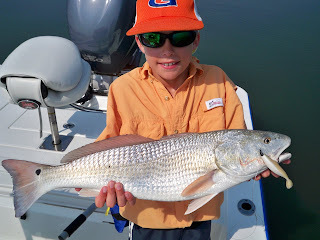 Jeremy wanted to hookup with some big fish today so, we took advantage of the calm weather and slid out the inlet and put Jeremy on some big AJ's. 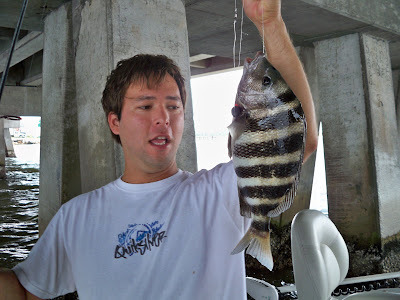 Jeremy and his father battled a bunch of these brutes and managed to get a few to the surface. 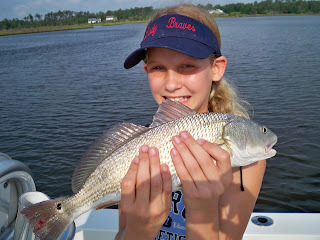 They opted to move into the backwaters and give the redfish a try. 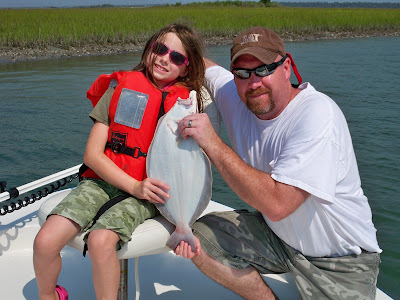 We made a couple stops and found a good school of fish working some shallow flats. 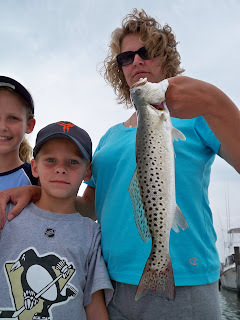 We were able to sight the fish and make targeted casts. 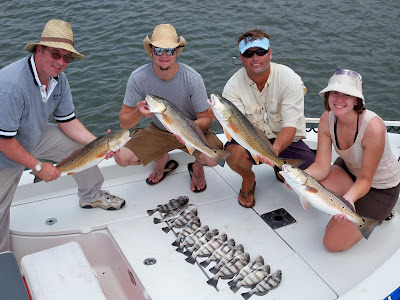 We hooked up and landed 8 redfish from 25 to 30in before heading back to the dock. Great Job today Guys! 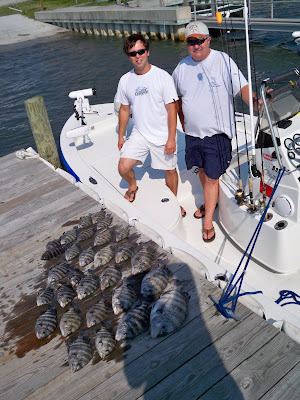 Regular client, Mike J., and his family were down on Vacation in Emerald Isle this week and today we broke up a 10hr trip with the first 5hrs fishing the ocean with 3 onboard then, coming inside to switch out and pick up Mike's three young girls for some playing in the backwaters and finally, Mike and his father-in-law Bruce stepped on for some afternoon sigthfishing for Redfish on the flats. Well, the morning proved a little tough with a 3 to 5ft ground swell and a chop on top of it... but, we eased our way off the beach and found some bait. As we were letting out first Cigar Minnow out the reel went to singing and shortly after, Mike put a small King Mackerel in the ice chest. 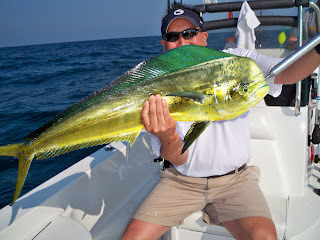 The action was steady for the next couple hours with several Mahi hooked up, a Barracuda, and many Amberjack. 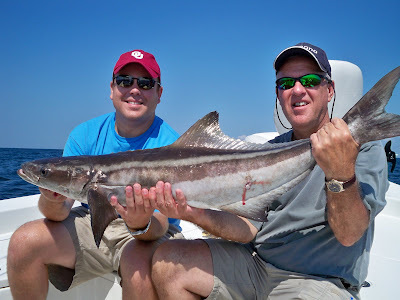 We also released a Cobia that was just under the 33in size limit. 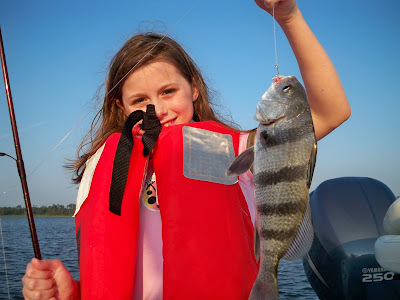 Later, in the backwaters with Mike's three girls, we went castnetting for shrimp, which the girls always love to do... and then, we worked some float cork rigs and let the girls fight some small black drum from 1 to 2lbs. 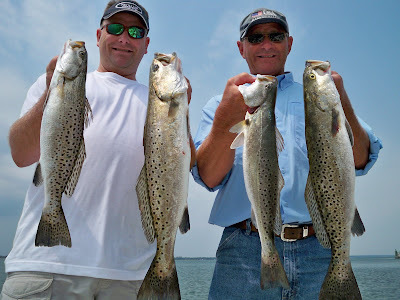 After dropping them off with their mother, I took Mike and Bruce searching the grass flats for redfish. About 30min. into our search we found a school of about 200 redfish and followed them for about 45 min. managing to hookup with 4 from 6lbs to 15 lbs. Another great day of fishing with beautiful weather! Thanks guys! CCFA 2008 Redfish Series - 2nd Place Finish and Most Spots! Well, Sat. 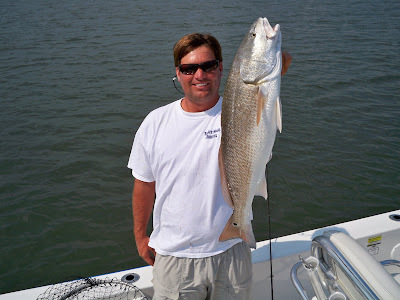 June 21st was the first of the three tournament Redfish Series that the CCFA is hosting this year out of Swansboro. The weather turned out to be tough on everyone as thunderstorms began rolling through about 9:30am and lasted until about 1pm. Mike and I went to our first spot and the fish didn't appear to be there. So, we moved around the area searching for them and just when we were about to leave the fish made their appearance. That was all Mike and I needed.... to know they were near-by. 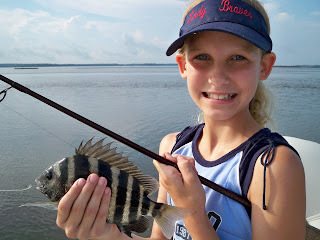 We followed them and picked off 10fish out of the school before we were able to corner them on a shallow grassy shoal. The overcast, rain, and breeze made it tough to visually see the fish but we were lucky enough to continue getting glimpses of them allowing us to make immediate casts into the school resulting in many double hookups. 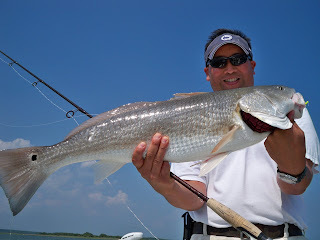 We hooked up over 70 redfish in 2.5hours and managed to land 56 of them with 5 reds between 26.5 and 27in. After releasing 54 healthy reds to bite another day, we moved on to attempt to upgrade the weight of our fish with some fatter fish. 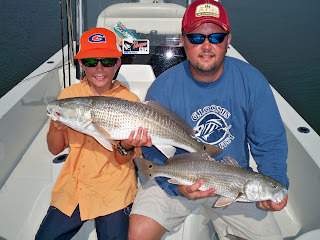 Several other tournament anglers took advantage of our move and eased over to enjoy some hook-ups with these redfish. Unfortunately, the rest of the day only offered up several more reds smaller than the two we already had in the livewell and we missed topwater strikes from 4 very large fish that just might have been those fat 26-27in fish we needed to replace our thinner fish. The day came to a close just before 4pm and we found ourselves at the scales with a two fish weight (including bag weight) of 15.88lbs It turned out to be an awsome tournament day and we actually had a camera man onboard filming all the action. As the video is edited and completed I will provide information as to its location online. 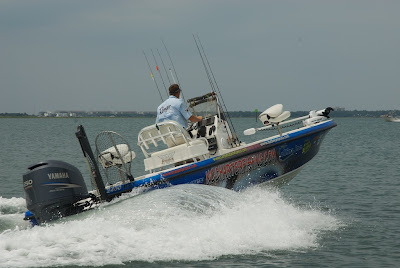 We wound up finishing 2nd Place in the main event for our two fish agg and also winning 1st place for multiple spots. Our next event is the IFA event in Savannah, Ga on July 12th. If anyone has some information about fishing the area around Savannah or the areas to the North up the Coast, please email me or call me. We are also looking for a good place to stay along the water near Savannah. Family Fishing! 11 Species Today!!! I had the pleasure of fishing today with Jamie A. and his family. 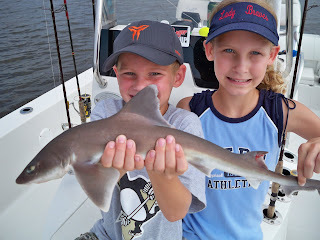 His son, Drew, and his Daughter, Brooke, did a great job today handling the bait and catching a lot of fish. 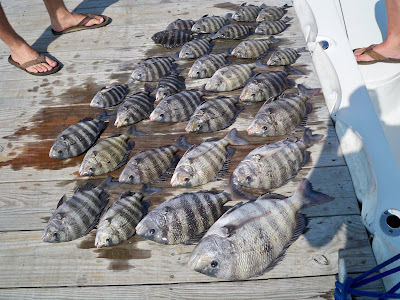 In fact, these guys caught 11 different species of fish including black drum, sheepshead, reddrum, flounder, trout, bluefish, hogfish, croaker, shark, pinfish, sand perch. They chose to take photos and release everything today for someone else to catch. Capt. 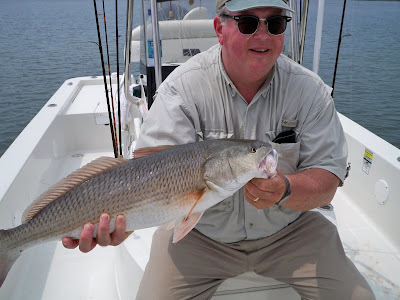 Mike Taylor with a Monster Redfish at 15lbs in the backwaters on our tournament prefish day. This was a school of pigs! 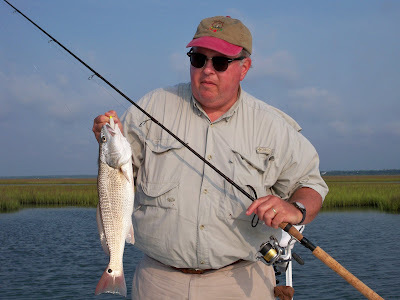 Red and Black Drum in the Backwaters! 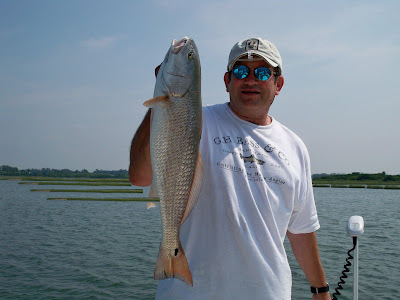 6/17/08 Redfish in the Backwaters! 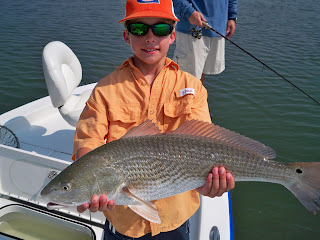 Well, with Joe and Pat aboard again this morning we went back out in search of some more redfish. 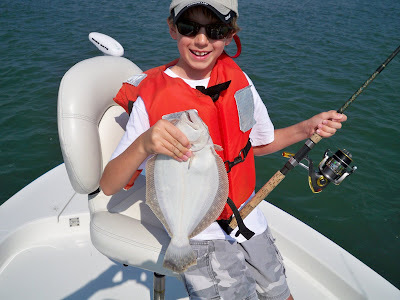 Things were tough this morning with the low tides but Joe managed a hook-up on his flyrod again. 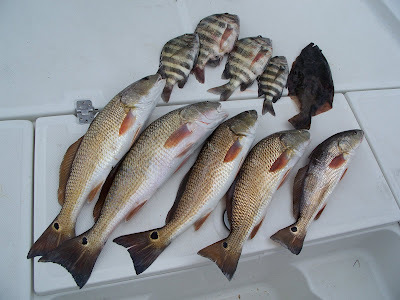 We covered a lot of water today only managing to pick up a stray redfish here and there. We wound up releasing 7 reds today as well as a couple small flounder. Great job guys! Awsome company as usual. I had Vance and his crew onboard this morning and we decided to take advantage of the calm seas and move out the inlet and work some nearshore live bottom for some Kings. We jigged some nice sized baits and began trolling in about 55ft of water. It was instant hook-ups on Barracuda and Kings. 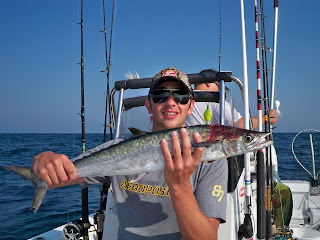 Surprisigly, we landed 3 Barracuda on light spinning tackle with very light steel leader. The Kings were small today ranging from 5 to 7lbs. I had the pleasure of fishing with regular clients Judge Joe Craig and Pat Meisky this morning. We had perfect conditions for locating redfish. Joe kicked back with his flyrod in hand this morning waiting patiently for Pat and myself to locate the fish with our topwater baits... first stop we found a small school of a dozen of so that had tight lips... they would'nt eat anything... regardless of our bag of tricks... if i didn't know any better i would have thought i was casting to a school of 5 to 10lb mullet! Anyway, second spot and we hit gold... or bronze that is! We found a school of about 100 fish and tracked them as they worked their way out of a creek and toward the inlet. 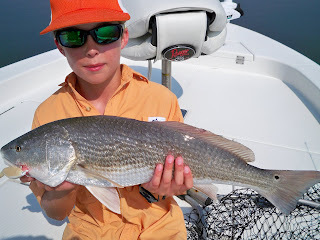 We wound up landing about 8 reds off this school and Joe managed to land his largest redfish to date on the fly at 25in. and 6.25lbs. We lost track of these fish and moved on to try several more locations... Our last stop was sweet... we found a good school of small, rat reds from 16 to 22in. along some grassy bottom and worked them hard for about an hour using berkley gulp pogies as well as topwater baits. We released about a dozen from this school and made our way back to the dock around just before noon. Great morning on the water with some great fishermen! Thanks guys! See ya tommorrow afternoon! 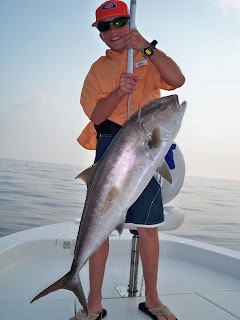 Mike and his crew worked offshore this morning and had a ball battling big AJ's on spinning tackle along with some grouper, seabass, and some other bottomfish. Sat. 6/14 Back Breaking AJ's, Kings, and Cobia! I had the Dewey group onboard again today as we busted through the inlet just after sunrise. We spent about 20 min. loading down the livewell with threadfin herring and cigar minnows before moving over to some live bottom that's been holding Kings. When we got to the hole and dropped our lines back it didn't take long to hook up with some big fish. Only problem is these fish weren't Kings. 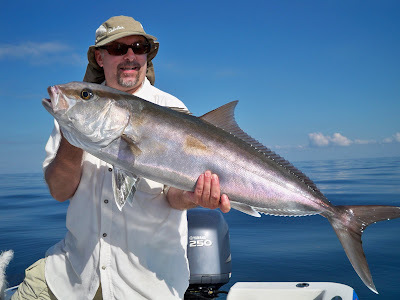 We found a school of about a 500 or more Amberjack. These fish were so willing to eat that you were able to hook them up on a plain 7/0 hook with no bait on it just by splashing it on the surface! 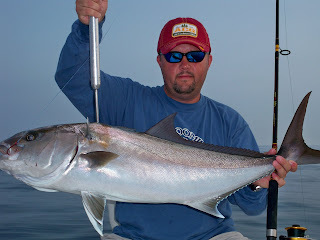 Don and crew battled a bunch of these brutes until we got tired of playing with them... then we moved on. 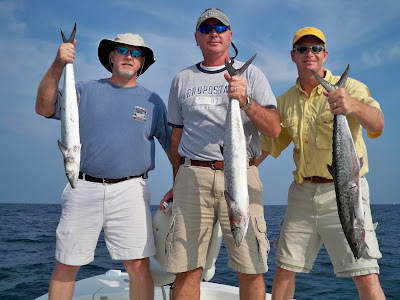 We had 4 nice King Mackerel hook ups but only one stuck. We wound up boating a nice King Mackerel about 17lbs. 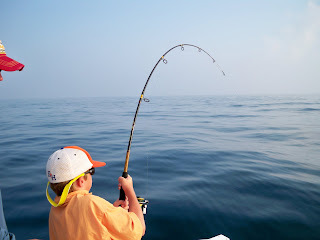 With slick cam conditions and no bite nearshore, we changed over to jigging bucktails on some nearshore ledges. We picked up a 3lb flounder, a few big seabass, and a 15lb Cobia before heading back to the dock. Great to have you guys onboard again! Well Friday the 13th turned out to be a scary day for the fish today! The NE Winds had no negative effect on the bite! I had regular clients Allen P. and Brian aboard as we flew out the inlet. 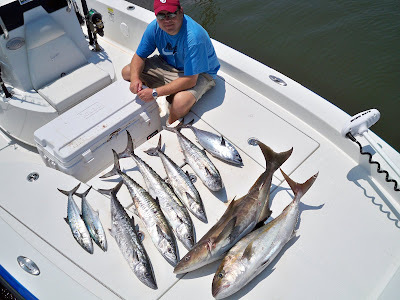 We stopped and jigged some fresh 5 to 7in cigar minnows, spanish sardines, and boston mackerel and then made a quick stop not too far off the beach. As we were letting out our first bait.... BAMMM! we hooked up on a King Mackerel... over a one hour period we had about 10 hookups and lost a couple Kings to a big Barracuda. 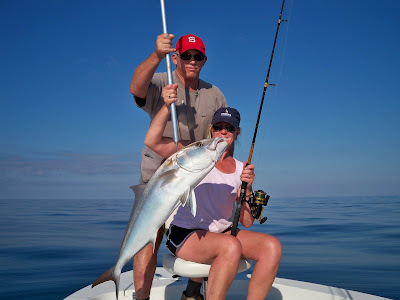 We moved on hoping to get a Mahi or a Cobia and wound up on a ledge holding a mess of Amberjack. While playing with the AJ's we lucked out and Brian spotted a Cobia on the surface... we fed a 7in. live spanish sardine to him and within 10min. 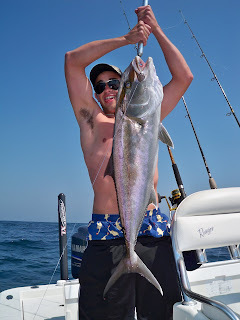 's Brian successfully landed a 23lb Cobia. We made another stop and found a good mixed bite of Kings and Spanish. 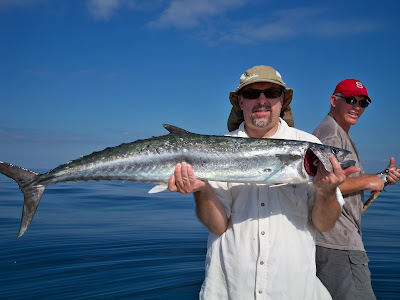 We lost several more kings to Barracuda and put a couple of 3lb Spanish in the boat before heading back to the dock. Great Job Guys! Awsome Day on the water. I talked with Capt. 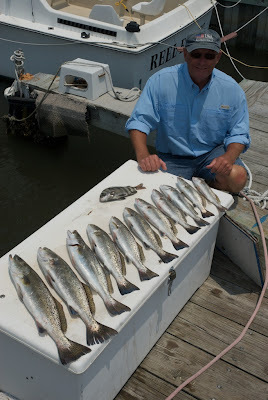 Mike Taylor several times throughout the day and he wound up fishing the backwaters for 6hrs. 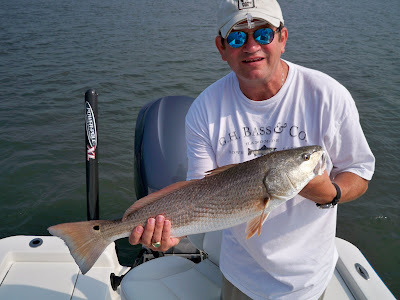 He and his client landed and released a mess of redfish.